This was the only day we couldn’t find a way to avoid the highway! In our quest to avoid the Pacific Highway for the whole trip, beforehand I’d sussed that once upon a time a ferry cruise used to stop at both Harrington and Manning Point, but the company no longer takes that route. A guy in a bike shop in Laurieton suggested that all you’d have to do was get some guy in a ‘tinny’ to take you across (for a few bucks…). We contemplated this as an option but decided that a combination of the weather (not fine), wrangling a tandem, and the likely cost/benefit for anyone to actually do it.. well, just ride the 20 odd km of highway and be done with it. We also had a friend from Hallidays Point (who was planning to meet and ride with us) suggest that he drive us and bike around from Harrington to Manning Point, and then show us the way through Old Bar. Apart from the practicalities of what he’d do with his vehicle, we said absolutely not! Totally not in the spirit of the ride! 😀 Yes, we were taking ferries a few times, and contemplated cadging a lift across in someone’s boat, but these are all ‘public’ options that anyone could do. Private transport? Definitely not! The highway turned out not to be so bad. You do notice the difference between the 100 and 110 zones… but, to be honest, Lakes Way, with the lack of shoulder in parts, was probably more stressful. We took a little detour around Oxley Bend Rd (Ghinni Ghinni) after stopping to take off our rain jackets, which gave us a nice little break from the noise of the highway. Also stopped at the south Taree service centre, because otherwise (for coffee addicts) there was nowhere pretty much between Harrington and Tuncurry to indulge. 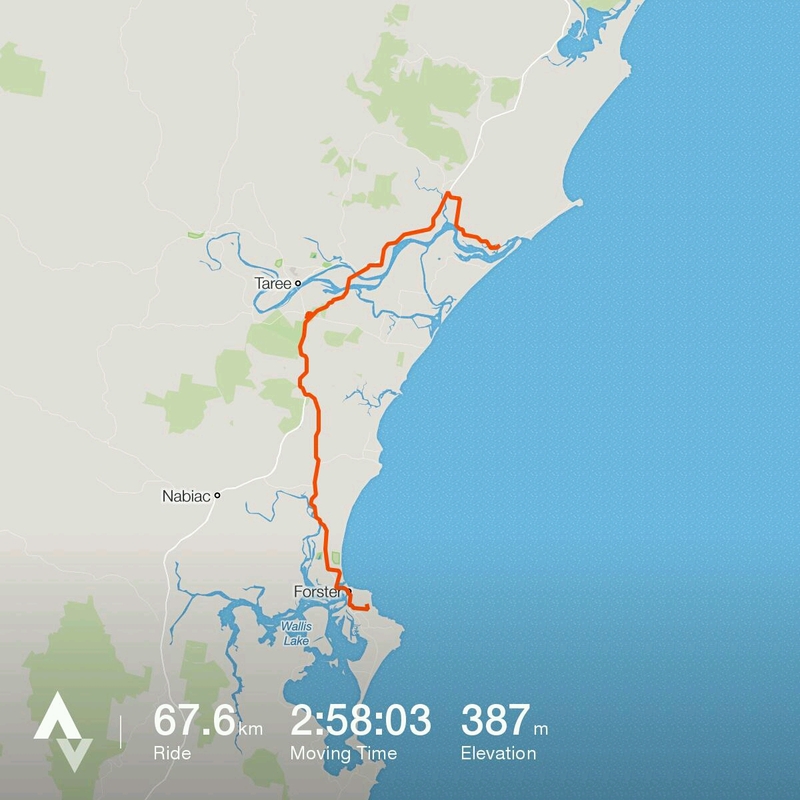 We did meet up with the aforementioned friend along Lakes Way, and thus had a guide into Tuncurry (so if you’re looking at the last bit into Tuncurry, that’s down to local knowledge).